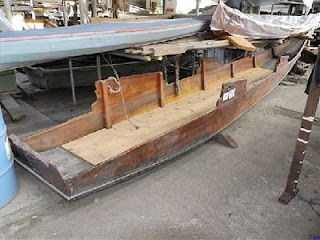 Just one more visit to the Turks online auction, where one of the lots is a lake boat from Austria. It was used in the TV fantasy mini-series The 10th Kingdom, which apparently had good reviews but bombed. The Hallstattersee is a huge Alpine lake. The mountains just plummet into the water, so it is impossible to build much around it. As a result, the town of Hallstatt could only be reached by boat until fairly recently, but despite this major barrier to trade the town was rich even in Roman times because of a huge natural deposit of salt in the mountains behind. The boat is described by Turks as a salt boat, but apparently this pointy punt, known as a platten or zillen, has always been a pleasure boat. Locals claim it is the prototype of the Tuebingen stocherkahn and the Oxbridge punt, apparently on the basis that they all have flat bottoms. 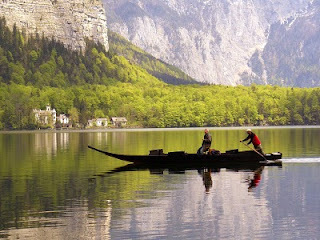 Be that as it may, the Hallstattersee platten is rather lovely and very interesting, seemingly combining a punt with a gondola. Like the gondola, it is rowed standing up and facing forward, though the action seems to be rather different. The oar is held by an odd-looking vertical board and prevented from flying off by a loop of rope. Terrific post Chris. How are you sleeping at the moment. So many wonderful boats at the Turks auction! That looks almost exactly like the j-stroke used to paddle a canoe on one side--the oar even has a t-handle one the end like a canoe paddle. Looks pretty much identical to the Gondola stroke - a bit easier to see what is actually going on with the gurt big blade though. Lovely boat.